The waitress was tickled by her comment and told the other waitresses that Eva had made her day. I dropped Eva off at school with a platter full of cupcakes that Allison had made for Eva’s class. She was excited about sharing the cupcakes with her class that she was bouncing off the walls, literally. She must have been excited more about going to Chuck E Cheese’s or as she calls it Chuck E Cheez-its. She doesn’t say many things wrong and it is so cute so we don’t correct her on it. 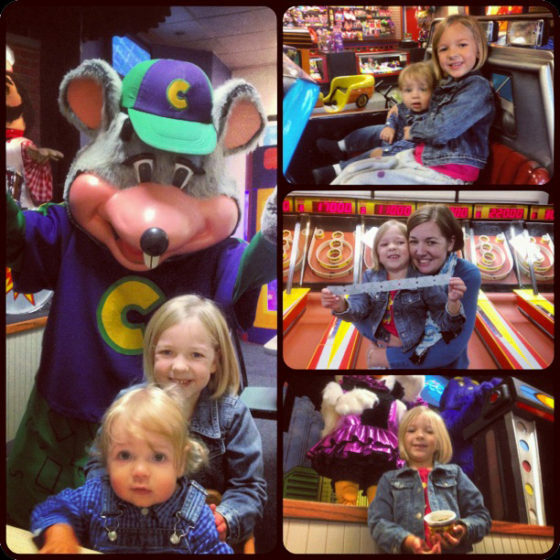 We must have heard Chuck E. Cheez-Its about 700 times in the past week too. It always makes us smile. It was a good time at Chuck E. Cheese’s. We were one of three families who were there, when we ordered the meal Eva told the young woman that it was her birthday and she gave Eva five tokens. We also got 20 tokens free because we signed up for the birthday club. We also used a coupon and got sixty tokens pizza and salad bar. Wasn’t too bad for about $10 a person and I love that all the games are only one token and that includes everything. That includes all the little machines that make little cards and photos and more. Allison dominated at skee-ball. Eva loved playing Arctic Thunder and I tried all those cheesey games where you win tons of tickets for no real reason and I LOVE Fruit Ninja for tickets. That is so much fun. 85 tokens was the perfect amount and we were there for about 3 hours. We sat by the animatronic characters and they were working right today. There were some fun parody songs including My Karate Kid and Larry Go To The Store. There was a video of “Don’t You Forget About Me” and it was the Breakfast Club but the people were Seniors, as in Senior Citizens. Here is the Karate Kid one. After I dropped off Eva at school I ran off and picked up the kittens from the vet. They made it through the procedures fine. 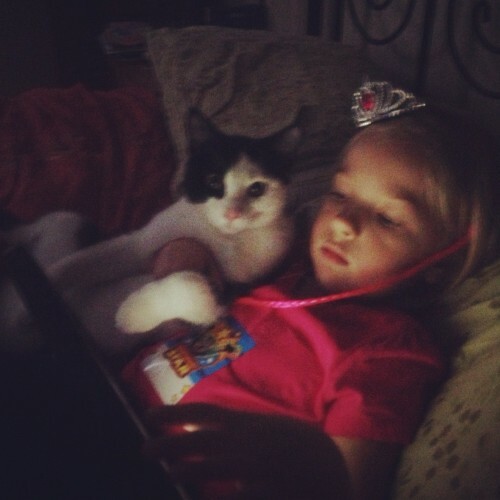 When we all came home after Chuck E Cheese’s Eva spent some time with James which is good because I captured them together as she played with the iPad. This is today’s YesVideo Photo-A-Day image, theme is Tuxedo. Tonight after dinner my Mom and Dad came over to give Eva her birthday gift, she’d been asking for a Pocahontas outfit and that is what she got. She’s going to be Pocahontas for Halloween and her brother will be Meeko (Pocahontas’ pet raccoon). They are going to look so cute together. That sound like the best 5th Birthday ever! She had asked on Monday to go to Chuck E Cheez it’s also! I can’t wait to see them all dressed up on Sunday. Happy Birthday Eva!